The Met Office have just issued a yellow warning of wind, as Storm Hector is set to bring strong gales to various parts of northern England, including Yorkshire. Storm Hector is set to bring a spell of extremely windy weather to the region between 03:00-15:00 on Thursday June 14, with gusts of 50 to 60 mph likely. Due to a deep area of low pressure, which is now named Storm Hector, this extreme windy spell will develop during Wednesday, with the strongest winds reaching Northern Ireland during the early hours of Thursday. These strong winds are then expected to spread eastwards across other northern parts of the UK during the morning. Westerly winds are likely to gust between 50 and 60 mph in many areas, including Yorkshire, with the possibility of winds reaching 70 mph in some exposed locations. These winds should gradually ease from the west during Thursday afternoon, where a spell of heavy rain will accompany the wind. It is possible that Amber warnings may be issued for some areas later on Wednesday or early on Thursday if this risk increases further. 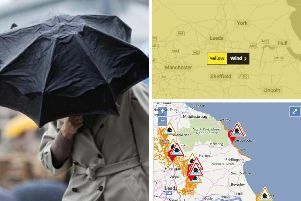 Yellow and Amber weather warnings represent a range of impact levels and likelihoods, which can include damage to property, travel delays and cancellations, loss of water supplies, power cuts and, in the most severe cases, bring a danger to life. According to the Met Office, this yellow weather warning means there is a small chance of longer journey times or cancellations as road, rail, air and ferry services are affected. Other areas affected include: Central, Tayside & Fife, Grampian, Highlands & Eilean Siar, North East England, North West England, Northern Ireland, Orkney & Shetland, SW Scotland, Lothian Borders, Strathclyde, Yorkshire & Humber.